The Internet-direct darling Outlaw Audio has always been at the forefront of home theater trends. The company was among the first to sell direct to consumers, focus its product line squarely on value and now offers a barrage of high-performing, high-value, lifestyle-oriented products. Outlaw's initial move into the more lifestyle-oriented marketplace came in the form of the Cue Model r1 table radio. The Cue Model r1 was followed by the OAW3 Wireless Audio System, which essentially made it so that any powered subwoofer could now become a wireless one. Hot on the heels of both the Cue and the OAW3 is Outlaw's newest lifestyle venture, the OSB-1 Soundbar with H-PAS. While Outlaw is hardly the first to offer a soundbar, the OSB-1 seeks to be something more by offering true high-end home theater and music performance at an attractive price. How attractive? Try $799 direct. While $799 may seem pricy for a soundbar, considering they can be had nowadays for less than $200 retail, Outlaw claims that its OSB-1 is not only better, but potentially all the home theater equipment some users may ever need, replacing costly components as well as cumbersome speakers all in a single chassis. Is the OSB-1 all the home theater product most users truly need? That's what I wanted to find out. • Read more soundbar reviews from HomeTheaterReview.com's writers. • See televisions to pair with OSB-1 in our HDTV Review section. • Explore more reviews in our Subwoofer Review section. Looking at the OSB-1 for the first time, one thing becomes immediately apparent - it's large and in charge. Clad in a combination of matte black finished MDF and black speaker cloth, there is no mistaking the OSB-1 for anything but a loudspeaker or piece of home theater equipment. Among its soundbar peers, it's not the sleekest-looking piece of kit I've ever seen, though Outlaw has always been about function first and style second. The OSB-1 itself measures 42.75 inches wide by five-and-a-half inches tall (more on this later) by six-and-a-half inches deep. It's also surprisingly heavy at an even 20 pounds. A surprisingly neat feature of the OSB-1's physical design isn't its ability to be table- or wall-mounted, although it's capable of both, but rather its ability to be "flipped," meaning it works as well inverted as it does right side up. Since the OSB-1's display and manual controls are actually located inside or on the face of a hump that rests above the bar itself, the ability for the display to right itself when inverted is an especially nice touch and opens up new possibilities for wall-mounting. Behind the speaker grille rest two three-quarter-inch tweeters and two four-inch woofers. Having only two four-inch woofers inside the OSB-1 makes Outlaw's claims of subwoofer-free bass all the more sensational, but that's where H-PAS comes in. H-PAS is a patented technology developed by Atlantic Technology to coax better bass response from smaller speakers and/or enclosures through the use of chambers and front-firing ports. H-PAS is how the OSB-1 can achieve a reported bass response of 47Hz from a soundbar possessing only two four-inch bass/midrange drivers. While 47Hz is not full-range territory by any means, it is a surprising claim coming from a soundbar that doesn't also employ a subwoofer, though the OSB-1 does offer a subwoofer out should you wish to add one later. The OSB-1's overall frequency response is stated to be 47Hz to 20Hz, with the crossover frequency coming in at 4kHz. The OSB-1's inputs, which are located inside the soundbar's hump. include three digital audio inputs (two optical, one coaxial), two analog audio ins and a subwoofer out. There is a single 3.5mm stereo input located on the OSB-1's front panel as well. 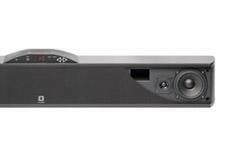 The OSB-1, thanks to its internal DSP, can decode and play back both Dolby Digital and DTS surround formats to create a faux surround sound performance. It also auto-senses either Dolby Digital or DTS soundtracks, though your choice of stereo downmix or faux surround is left up to you and is selectable via the OSB-1's remote or manual controls located on the soundbar. Speaking of the OSB-1's remote, it is very simplistic and small, possessing the essential controls for source, volume, bass, treble, mute and mode. Mode refers to the OSB-1's ability to play back in your choice of two-, three- or five-channel surround sound. The remote is basic but straightforward, and easy enough for any novice to pick up and/or understand without having to consult a manual or loved one. Installing the OSB-1 into one's system, specifically my living room, is about as easy as it gets. As I moved recently, my living room is no longer my dedicated listening space, but is instead an actual living room, meaning the only equipment allowed in it now are HDTVs and soundbars. I connected the OSB-1 to my Dish Network HD DVR and Sony Blu-ray player using two one-meter runs of generic optical cable. From there, it was merely a matter of messing with the OSB-1's bass and treble controls before settling on a sound that I felt best represented neutral - and not zero. Zero is not that setting, which was confirmed by Outlaw. Outlaw was kind enough to send along a subwoofer in the form of the company's diminutive M8, just in case, but I ended up not using it at all during my evaluation of the OSB-1. While the OSB-1 is predominantly aimed at the home theater enthusiast, this didn't stop me from listening to a few CDs - after all, it has but two speakers. I kicked things off with Moby's Play (V2 Records) and the track "Everloving." I experimented with all the various DSP and faux surround sound options, ultimately settling on "5 Channel" and "5 Channel Expanded" as the optimal settings for even two-channel listening. Read more about the performance of Outlaw Audio's OSB-1 soundbar on Page 2.